It's another foundation review! That's because I just can't get enough of them! My quest for that perfect foundation is never ending... So here I am, showing another promising foundation. I've tried Lancome Teint Miracle once when they did I a makeover on me and I just fell in love. I've always been drawn to expensive foundation since I've proven that they are the least that gave me breakouts. For a girl who seem to always get breakouts no matter she does, it's crucial for me to use a foundation that won't aggravate my skin condition. 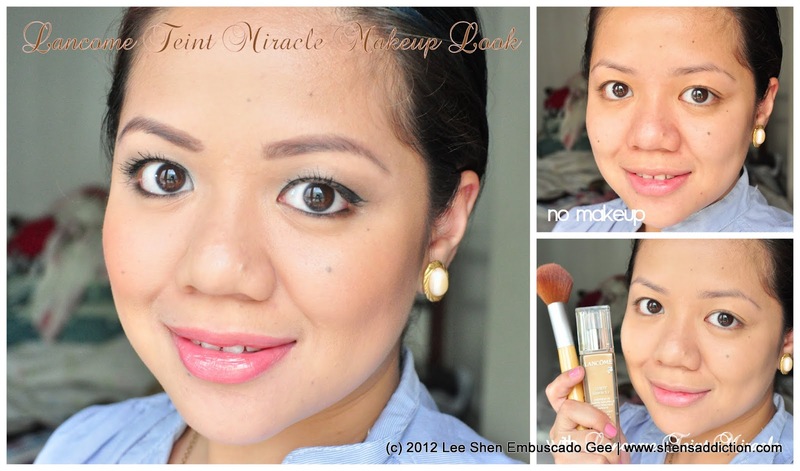 Teint Miracle is Lancome's latest foundation available here in the Philippines. It's has a light coverage that has illuminating properties that makes the skin appear perfect in all kinds of lighting. Lancôme invents its 1st foundation that helps to recreate the aura of perfect looking skin. Instantly complexion appears flawless and luminous, as if lit-from-within. Perfection through light – Teint Miracle works to help recreate and boost the skin’s luminosity. Immediately the complexion appears flawless and fresher-looking. With the description, it looks as if it isn't meant for Asian skin, much less a Filipinas. But I'm glad to prove you wrong! It's a great foundation and it just gives that nice even-looking complexion that you'd want for everyday use. O-04 appears too yellowish on my skin that I was scared I got the wrong shade. But when I used it, I was amazed at how it matches my skin and it somehow seem to appear brighter. Maybe the only downside I can see it that this foundation is not really an oil-controlling foundation. Easily remedied with an oil blotter or your favorite press powder. I like using my Lancome Maquicake. Teint Miracle looks seriously like a second skin on me. It's amazing how it can give it a subtle glow. How are you liking the Teint Miracle on me. Want to try Lancome Teint Miracle? It's easy. Just visit any Lancome counters at Rustan's )Shangri-la and Makati), Lancome at Greenbelt 5. I tried the Maqui version. It's light and spreads well ^_^ Wouldn't say it's oily compared to other foundations.